The Dutch Islands of St. Eustatia, Saba, and St. Martins; The French Island of St. Bartholomew; The English Islands of St. Christophers, Nevis, and Anguilla; with the smaller Islands and Keys adjoining. This is a scarce 1781 John Lodge map of the Leeward Islands or the northern islands of the Lesser Antilles chain in West Indies. It covers from Hat Island (Sombrero) south as far as Nevis and depicts the colonial possessions of the Dutch, French and the English, including the Dutch Islands of Sint Eustatius, Saba, the French Island of St. Bart or St. Barthelemy (Bartholomew) and the Island of St. Martins, and the English Islands of St. Kitts or St. Christophers, Nevis and Anguilla. 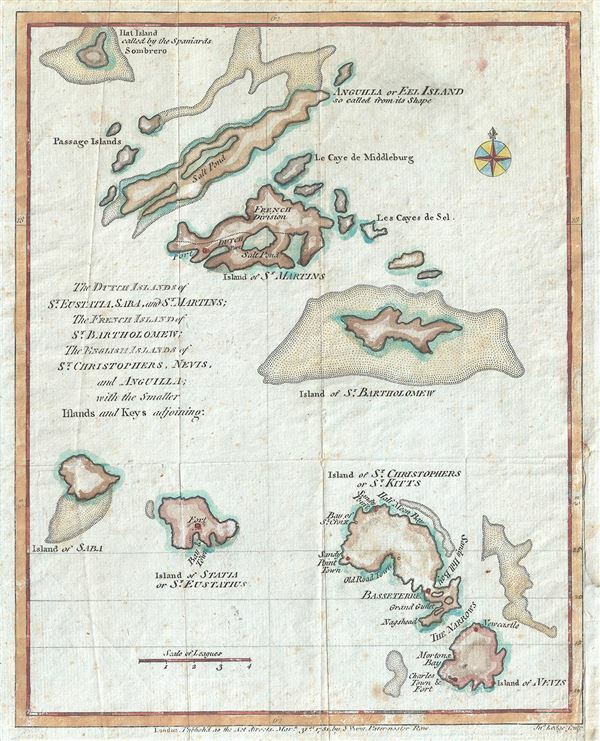 Several smaller islands and keys are noted. The map identifies several towns and forts throughout. The Spanish Main was the point of departure for enormous wealth that was shipped back to Spain in the form of gold, silver, gems, spices, hardwoods, hides and other riches; because of this, the area was ripe territory for pirates and privateers. The late 18th and early 19th century saw a resurgence of privateering as successive colonial powers jostled for supremacy in the region. This map was created by John Lodge and published by J. Bew on March 31, 1781. All maps specific to the Leeward Islands very rarely appear on the market, making this a rare opportunity. John Lodge (1735-1796) was a British engraver, map seller, draughtsman and stationer active in London from roughly 1755 to the late 18th century. Lodge, born in London, was apprenticed to Thomas Jefferys, one of the most prominent and prolific map publishers and engravers of his day. He produced several maps for The Gentleman's Magazine and The Political Magazine and other publications. He also engraved book-illustrations, portraits and botanical plates and taught etching and engraving. Around the 1780's, he is believed to have lived to Dublin, where he did a significant amount of engraving work for Dublin booksellers. Lodge was survived by his wife Ann, to whom he left his entire estate, and his son John Lodge, who was also an engraver. Very good. Original platemark visible. Minor wear along original fold lines. Verso repair along lower right margin, not extending onto printed map. Boston Public Library, Leventhal Map Center, G5165 1781 .D88.